As I approach the anniversary of the ChickenPieCraft server reset, it is time to take stock of the progress made in building New Lusitania: The Pigman Empire. I’ve spent more time in this world and on this project than I have in any other Minecraft world I’ve played. And it shows, as I’ve been able to create some pretty large builds, some big automation projects, and flesh out a history and mythology for New Lusitania that exceeds anything I’ve done in past worlds. It’s been really fun and rewarding. So, without further ado, let’s start with completed projects. First up, New Lusitania was founded. After about a month of initial work on the server, I took some time to evaluate potential locations for New Lusitania. 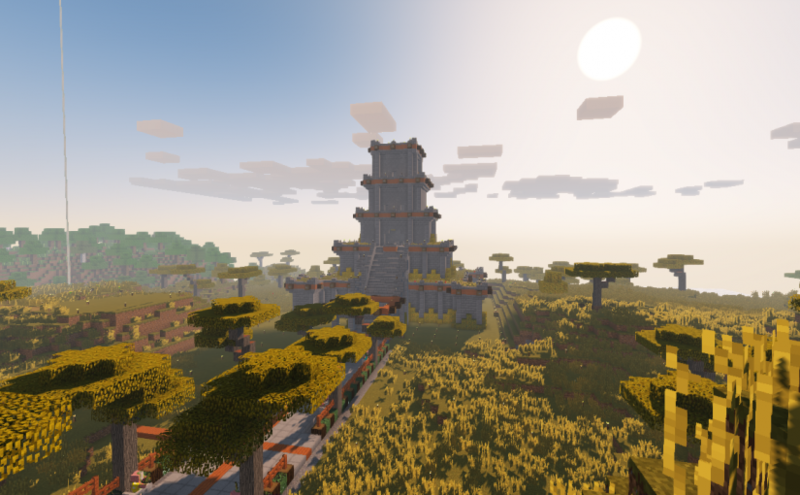 I had some specific ideas in mind – savanna biome, a couple hundred blocks square, clear boundaries between other landmasses, some nice plateaus, water access – and those were of course modified a bit as I looked at the reality of the landscape. One of my first projects, once I chose a location, was getting an iron farm going. Iron farms are vital for any large redstone builds, for setting up beacons, for rail systems, and for some types of decoration, like iron bars. Over time, I built out two more iron farms. 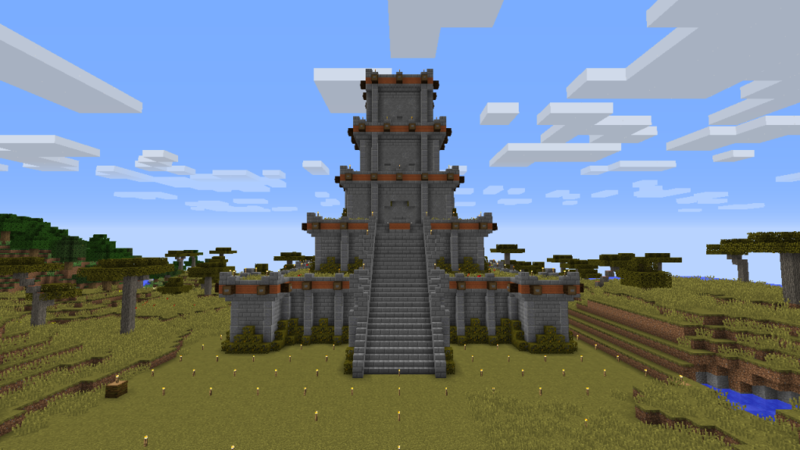 Each of these is built as a villager prison, with pigmen gaurds on four towers surrounding the farm. They each also have space underneath for other builds. On that first iron farm I built, I used the space beneath it to carve out a stone quarry. At this point, I still didn’t have a proper mine built, but needed large amounts of stone for the first big build of New Lusitania. So a stone quarry was a necessity. My largest build up to that point, I based the Pigman Palace on Noodlor’s Stranglespire design. Building the exterior took quite a while. On the interior, I made some changes to how to get around (stairs and ladders), but otherwise haven’t fleshed it out much yet. Under the second iron farm, the pigmen trapped a farmer villager and force him to farm wheat. This wheat farm has a rail system beneath with a hopper minecart to pick up and collect all of the wheat that is dropped. Our nether hallway is a branch off of the main north nether hall that goes from spawn to the edge of the map. This was a fun decoration project that captures the design themes of New Lusitania in a way that makes a long hallway interesting, rather than boring. Along the way, I began to flesh out the history and mythology of New Lusitania. This is mostly recorded in a few blog posts here, but I hope to document it in the empire in a library at some point. Also, the history and mythology informs the projects being built in the Pigman empire. The first big project that is directly tied to New Lusitania’s mythology is the pigman and gold farm. New Lusitania needs a population of pigmen, which means it needs an easy way to spawn pigmen that won’t despawn. To do that, New Lusitania has a pigman farm based on the mythology of creation. This farm spawn pigmen, and those that are considered worthy (i.e. won’t despawn) can be saved for assignment around the empire. Those who aren’t worthy are sacrificed to provide gold for the empire. The server has a common city east of spawn where all the players can create common builds and contribute to a larger, communal metropolis. At this city, New Lusitania has erected an embassy, with a map of it’s empire, an ambassador, two guards, an administrator, a small library, a balcony for pigmen worship, and rooftop gardens. The witch farm was actually built before New Lusitania was founded, and it is the one other contribution I’ve made to the server. 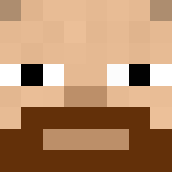 Though not optimally efficient, it is a good source of glowstone, redstone, sugar and gunpowder. The pigmen of New Lusitania love to build with acacia wood. Unfortunately, acacia trees are the most annoying trees to harvest. So, because the pigmen are an enterprising and engineering culture, they built an automatic tree farm that can handle acacia trees, as well as the other farmable tree types. This was a huge project that took a long time, with regular breaks to work on other things. It’s wonderful when it’s working, but when something goes wrong, however, it’s a pain to fix it. I broke it while working on this blog post by AFKing at it through a server restart. So it’s currently not operational. The latest project has been to build a late game mine, with proper collection of mineable materials, a nice design, and beacons to speed things along quickly. Most of this ongoing work is pretty obvious from the discussion above, but it’s worth calling out some specifics. The stranglespire pigman palace is a great anchor for the empire, but it really needs to have a purpose beyond just looking nice on the outside. More work can be done on the outside, but it’s the interior that really needs to be fleshed out. The main throne room needs to be properly luxurious for the pigman emporer. There are two floor below the throne room that should house equally extravagant meeting rooms and treasure troves of the empire. The levels above the throne room also need to have purposes and be decorated accordingly. The pigman and gold farm is functional, but ugly. One plan I have is to make the rail passage that surviving pigmen travel down show the four stages of growth that a worthy pigman can go through (represented by leather, gold, iron, and diamond armors). But there is much more than that which should be done. 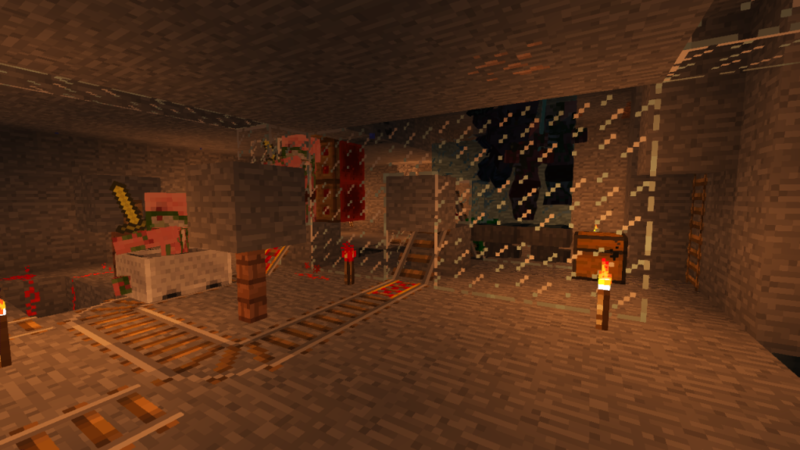 Outfitting the whole thing in the engineering ethos of the pigmen is important, and providing a proper entrance, storage for collected gold, and connection to an empire wide rail network are all items on the todo list. I gathered some cows under my third iron farm, but haven’t yet built my standard cow farm there. It’s definitely something I want to do, as it’s nice to have a ton of leather for books and item frames. I know where I want the village market to be, surrounding my northernmost nether portal and next to the mine entrance, but I’ve played around with a couple different designs and nothing has stuck yet. That’s definitely something I want to flesh out. As I mentioned earlier, the tree farm is currently broken. I AFK’d there through a server reset and a bunch of different things broke on it. I thought I had it fixed at one point, but that just led to larger problems. A good filler activity, when I don’t have other work to do, is to go through and repair it. It’s somewhat tedious, but using a schematic to make sure I get it right is helpful. The initial recordings of New Lusitania’s history and mythology have been written. But there is more in store. Fleshing it out and then tying it to the current design and structure of the empire, it’s architecture, and it’s social classes will be an ongoing project. Only small steps have been taken to populate the empire with pigmen, and the only villagers in place right now are at the iron farms. Long term, though, there will be pigmen and villagers throughout the kingdom: stone quarry, cow farm, mine and entrance, stranglespire, tree farm, gold/pigman farm. Generally, the pigmen will be in overseer roles, while the villagers are slaves used for grunt labor, farming, and trading. A first pass has been done on the palace boulevard that leads from the palace district to the central district. But it’s far from a completed project, and will eventually be the start of a full transportation network within the empire. The nether hallway to New Lusitania is complete, but it currently leads to a barely functional nether hub. That hub needs to be fully designed and put in place. The design will be similar to the hallway, but will also hark back to the actual layout of the empire itself. While the natural landscape of the New Lusitania empire is quite nice, there are a few terraforming projects that would really make it pop. Deepening the main lake is the big one. Additionally, cleaning up the naturally spawned village, filling in many of the smaller ponds, and deepening and widening the rivers are all possibilities. While doing the initial work on the witch farm, I came up with some ideas for a final design. I want the witch farm itself to be fully enclosed within a haunted house. That haunted house will be in permanent darkness because it will be covered by a spooky floating island that will house the AFK location, as well as the collection area for the drops from the farm. It will be a very large project, but one that I believe will be very rewarding. I went through the current state of New Lusitania in part because I’m going to take a break. Hopefully not a long one. I still love the vision for New Lusitania, and feel that I’ve made a great start on it. And stuck with that start for a year now. There’s still plenty more I want to do, but I recognize that I need to take a break so that I can come back to it fresh and excited about the challenge. When I do come back, I’ll probably tackle the witch farm project first. It’ll be a nice change of pace, a big project, and really satisfying to complete. It’ll be good after spending some time doing shorter, exploratory play – maybe some UHC, maybe some Iberia, or Biome Bundle, or trying out some other mods. I’ll make sure to share my adventures here.